When I was younger, I didn’t really understand wardrobe essentials. I’d buy anything and everything (as long as it fit into one specific category – cheap) and wonder why I never had anything to wear. Despite having more clothes than my (relatively small) wardrobe could realistically hold. I’ll stop now. I understand that you are smart. You get the picture. My wardrobe was overflowing. I had no signature style to speak of. And I know I spent way more on ‘fast fashion’ than I realised at the time. Clearly, things have changed for me over the past decade. First up, I visited France – and specifically Paris, the home of the small wardrobe – time and time again. I became fascinated with how Parisian women dress. I searched out every ‘dress like a French woman’ piece posted to the internet. I’ve read dozens of books dedicated to French style (check out my current favourite here). I’ve spent hours (or perhaps that should be days or even weeks) people watching, making notes of outfits and colour palettes that appeal to me. Eventually, I became so interested in style and the impact it could have on women’s confidence that I qualified as a Style CoachTM. I learned everything I could about style personalities, body shapes, colour combinations and accessorising. And, after all this watching, reading and studying, what do you suppose is the biggest lesson I’ve learned? The answer is simple really. That the foundations of style lie in your wardrobe essentials. And I use the word your quite deliberately. Because when I suggest essentials, don’t assume that every woman needs the same set of ‘must have garments’. That’s where so many of those internet pieces I devoured got it wrong. While there is often commonality in the style basics, there is also a whole lot of room for individuality when it comes to wardrobe essentials. So, How Can You Tell If An Item Is One Of Your Wardrobe Essentials? Establishing the criteria for wardrobe essentials can sometimes be tricky. Trends, lifestyle and even your weight can influence your thinking. Here are some coaching questions to help you to start considering your own essentials. Are there any items that form the basis of your signature style? Which garments (beyond yoga pants) do you find yourself reaching for over and over? Got any items that you’ll drag out of the ironing pile to press individually? Or that you wish you could wear day after day? Are there any specific outfits that make you feel special, or that you receive a ton of compliments about? Have you ever pined for a piece of clothing once you no longer had it? Is there an every day item you wish you’d never got rid of? Which items in your wardrobe do you consider to be the work-horses? The ones that can take you from work to weekend, corporate to casual and that you’d never leave at home when you are travelling. It probably comes as no surprise that my own wardrobe essentials have a bit of French flavour to them. I make no apologies for the fact that French style influences my outfit choices every day of the week. Arguably though, my basics are so universal they could easily be found in a stylish woman’s closet anywhere in the world. A Long Sleeve White Button Down Shirt. 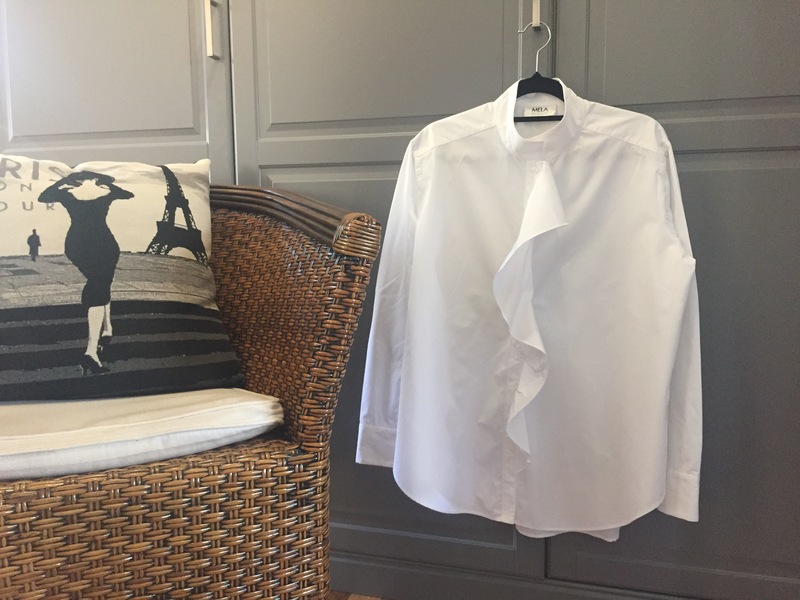 While I mix up the cuts fairly regularly – sometimes they are fitted, sometimes oversized, occasionally I’ll go collarless – you’ll always find a crisp white shirt in my wardrobe. They are perfect with black for the office and I love them with jeans on the weekend. My present favourite has an impressive ruffle down the front. High Waisted Skinny Jeans. My go-to jeans are Paige Hoxton Skinny jeans and I have them in black, grey and blue denim. all with differing ankle details. Fun fact – I never pay full price for my jeans. Knowing which style suits you and being clear on your size means that you can take full advantage of sales when they come up. I stalked my grey jeans for ages before they came on sale, and then snapped them up for less than half price. High Waisted Black Pants. My body shape looks best in high waisted clothing, and black pants are no exception. I always have at least two pairs in my wardrobe. They are perfect for work and dressier events. White V-Neck T-Shirts. I always have a few of these on hand, in both short and long sleeved varieties. Great under blazers or for lazing around. I always look for v-necks wherever possible because they flatter my shape. A Black V-Neck Long Sleeve Top. Not a t-shirt here, but a dressier number. Another great work and play item. Cashmere Pullovers. Light, soft and warm, a little goes a long way with cashmere. I aim to have one black and one grey cashmere pullover in my winter collection. And I always travel with at least one cashmere jumper – you never know when you’ll strike a cold snap. As far as I can tell, there is only one danger in fully understanding your wardrobe essentials. Time and time again with my coaching clients, I see them buying a great many multiples of their unique basics. The exact same item, in exactly the same colour. Not just one or two items but sometimes up to a dozen! I fully understand the temptation (especially when it comes to black pants, a particular weakness of mine). When you are onto a good thing, you stick with it, right? Well, yes, but that doesn’t mean you need to overwhelm your style with your foundation pieces. It’s a strategy that can lead to overspending and boredom amongst other issues. Watch out for this tendency in your own buying habits and, where possible, limit your initial purchases to three of any one item at the most. And only replace these items when you really need to. In my case, the jeans and pants tend to last for ages, as does the cashmere if I’m careful with my washing techniques. The black v-neck usually offers me several seasons, while the whites tend to need replacing at least once a year. Your turn now! I’d love to learn about your wardrobe essentials. Which pieces would you be lost without? And don’t hesitate to reveal any style lessons you’ve learned over the years. Please share your thoughts in the comments section below. Please note: This is an unsolicited post and no compensation of any kind has been received by the brands mentioned in this post. I am giving second thoughts to the t-shirts, though, after reading your post. I love a scoop-neck rather than a crew or a V, and that can be hard to find. Still, did I really need 6? And will having them in my closet inhibit me from trying something that might be even more flattering if only I tried it? 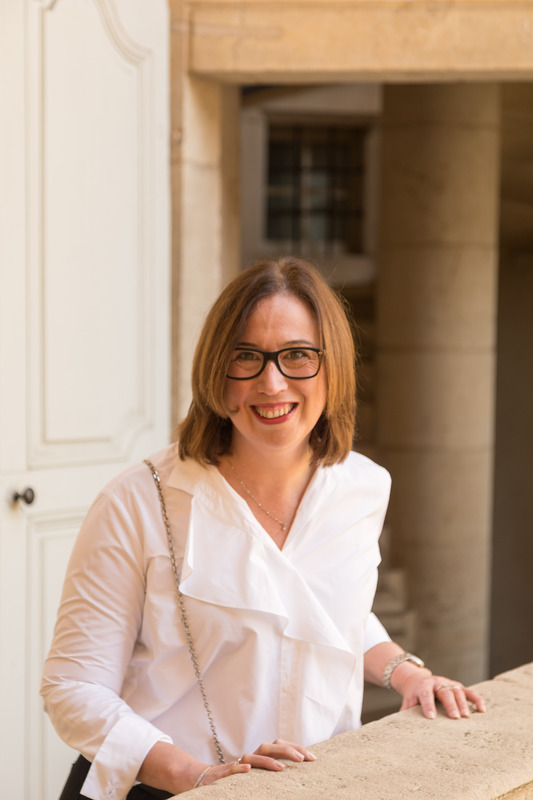 In Paris last year I bought a lightweight cotton/rayon blend draped t-shirt that I love, and I am seeing a few here now. I’m so glad I found you! I’m looking into creating my own “capsule wardrobe” because I recently downsized my home and a Narnia style wardrobe is totally out of the question. I recently realised that if I want to downsize my clothes then I need to look into French styling. I bought the stereotypical striped tee as I tend to wear a lot of black but don’t quite have the nerve to switch completely over to something white. I’m a charity shop shopper and my shirt was on the sale rail for 50p! And now I can’t live without it! My three quarter length black skinnies (£2.50) went in the laundry Yesterday and and I’m pining for them already. My style tends to be somewhat alternative (bright yelly crew cut hair) but I can still pull this off. I can be as individual as I want yet still understated and stylish. Thanks for the tips! Thanks so much for your comment Mitchell – I’m so pleased you are enjoying DF. I absolutely agree that you can be individual and stylish – in fact, I tend to find that the most stylish also tend to be the most individual. And I love your environment and budget friendly approach to defining your style. You’ve inspired me to think about creating posts that cover both points – thank you.